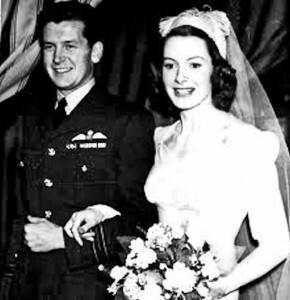 The marriage of Anthony Bartley to Deborah Kerr. When Swanbourne RAF fighter ace Anthony Bartley (1919 — 2001) was working in America, lecturing in fighter pilot tactics, he also made the acquaintance of several film personalities (e.g. Elizabeth Taylor). Subsequently, when then stationed in Brussels it was through an introduction by Stewart Granger in 1945 that he became acquainted with Deborah Kerr (1921–2007). The two stars and the rest of the cast of the E.N.S.A. production of ‘Gaslight’, were invited to the Officers’ Club. The marriage of Anthony Bartley to Deborah Kerr, 1945. Anthony was allowed 48 hours of compassionate leave, so before the wedding Deborah travelled alone to Swanbourne to make the acquaintance of her prospective parents in law. There was considerable publicity around the couple who were married at St. George’s Church, Hanover Square, London. Soon after, Anthony embarked on a new career in Television and film production and the couple’s main home was in California. What background was Deborah from? How well were they really suited? Some light may be thrown on their relationship by the various biographies and mini biographies which have been published. 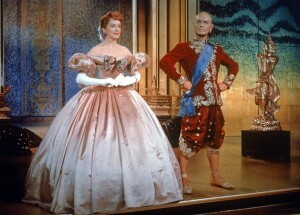 Among her most famous film acting roles were in the musical The King and I (1956), and opposite Cary Grant in An Affair to Remember (1958). In 1967 (aged 46) she starred in Casino Royale, achieving the distinction of being the oldest Bond Girl in any of the James Bond films. Opposite David Niven, she became a dowdy spinster in Separate Tables; with Cary Grant, she starred in the highly successful weepie An Affair to Remember. Deborah Kerr in a screen kiss with Cary Grant. Anthony and Deborah had two daughters, Melanie Jane (born 27 December 1947) and Francesca Ann (born 20 December 1951). The couple often came back to Swanbourne to visit Anthony’s parents at the Cottage (opposite the Old House), and they were always interested in what was going on in the village. Francesca Anne was Christened at St. Swithun’s Church, Swanbourne on one of these visits home. 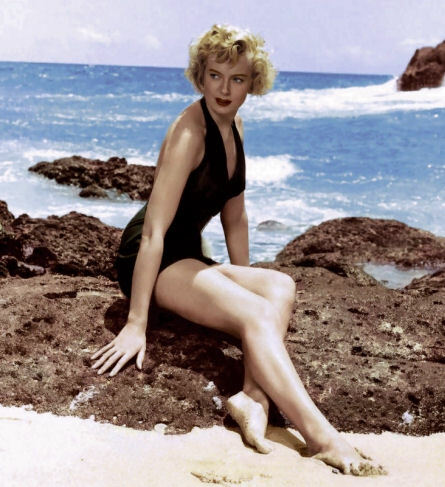 Deborah Kerr beach scene in the 1953 film ‘From here to Eternity’. After 14 years together, their marriage proved troubled, owing to Deborah’s greater fame and financial success. Their relationship became dogged by the persistent rumours of affairs with some of her leading men such as Cary Grant, Stewart Granger, Robert Mitchum and Burt Lancaster. For some time, Deborah and Anthony Bartley had been drifting apart; she on location, he as European representative of CBS television. Then, on the set of The Journey, the German-born scriptwriter Peter Viertel became a witty, sympathetic companion and he and Deborah fell in love. In May 1958, the Bartleys announced an amicable separation, and the following year, 1959, divorced. Deborah was having an affair with Viertel – and Tony wanted to take the two children away from her and make them wards of an English court, so that they would remain in England with him, and so that he could later get custody of the children. She knew that there had been gossip about her and the handsome, thirty seven-year-old writer who was working on the script of The Journey in which she was starring. There had been many late afternoon and evening conferences with the brilliant, sophisticated writer. Peter had been attentive. She had found him charming. But she had tried to be circumspect in her behaviour. She had always been shocked at mothers who were so openly loose in their behaviour that their actions brought scandal on their family. Now she thought, her mind whirling with the impact of the news, What will the children think when the newspapers in London headline this kind of story? Tony’s always been popular in England – everyone remembers him as a war hero. What will they say about me when this accusation is aired? I wouldn’t care so much what they said about me-if it weren’t for the children, but how can they stand up to such scandal? 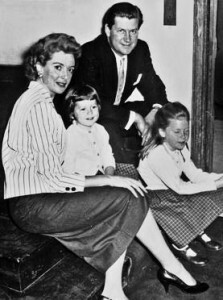 Family photograph of Deborah & Anthony Bartley & their children. Francesca, born in December 1951, (pictured in the centre) was baptised in 1954 at St. Swithun’s Church, Swanbourne, Bucks, England. How much worse for her children if their father made them feel their mother had disgraced herself, and had ignored them and their welfare for a lover. She instructed her lawyer in California to enter a law suit in Los Angeles and a counter suit in Europe. She succeeded in keeping custody of the children. Anthony also remarried, and both died (and were buried) in the British Isles; Anthony in 2001 and Deborah in 2007. 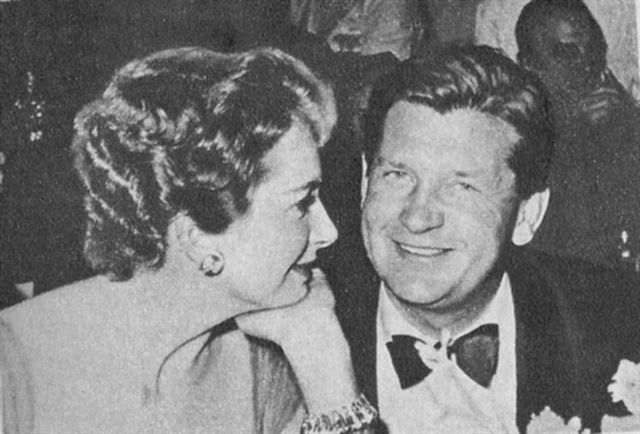 Deborah Kerr & Antony Bartley in 1957. How Deborah looked back on her Career. 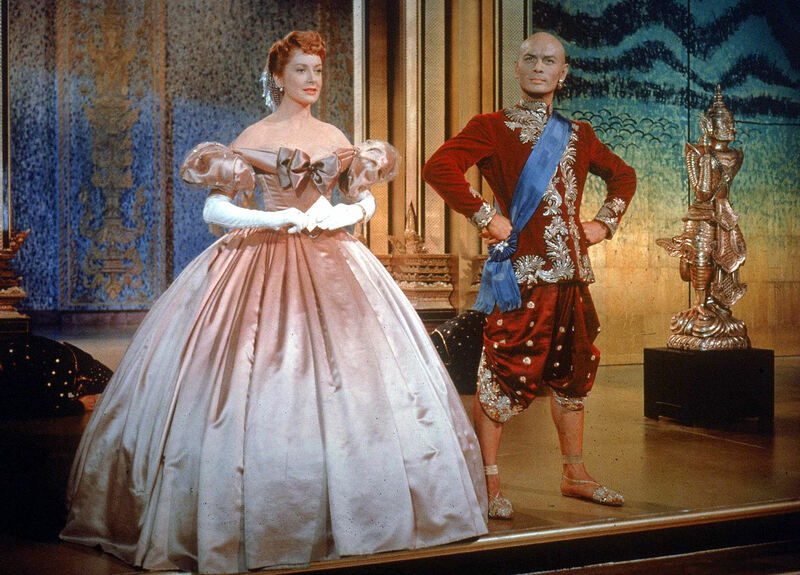 Of her early MGM roles she also said: “I wore a halo of decorum and was just about as exciting as an oyster.” Both of these quotes were drawn from interviews that Deborah Kerr gave to popular American magazines during the 1950s. Her frustration was apparent and public, but moviegoers, producers, and directors were still stunned by From Here to Eternity and never quite accepted that Kerr wasn’t a “goody-goody” like Ginger Rogers had been before her. Deborah wanted to earn her stripes as a dramatic actress, not as second-fiddle to a more interesting male character. Neither did she wish to be looked upon as simple eye candy. However, in 1994 she was awarded a special Oscar, inscribed “to an artist of impeccable grace and beauty… whose motion picture career has always stood for perfection, discipline and elegance”. Subsequently, Deborah was appointed CBE in 1998. 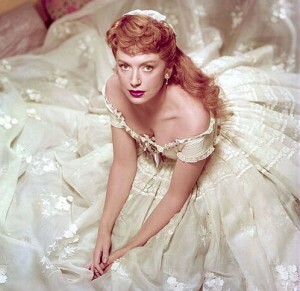 CLICK TO VIEW DEBORAH KERR INTERVIEW WITH FILM CLIPS INCLUDING THE FAMOUS “KISS ON THE BEACH“. CLICK HERE for link to Anthony Bartley in the Battle of Britain.